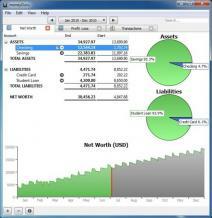 moneyGuru is a powerful piece of software that allows you to stay on top of your expenses in a simple way. The application lets you schedule your incomes, note expenses and analyze the money flow for efficient fund management. The clean layout provides several tabs where you can manage your funds, and the information is sorted in tables. Most of these tabs, provide the option of visual feedback under the form of graphs and pie charts. To quickly get started with entering new data, moneyGuru provides an example file and also, there’s the option to import existing data from various file formats like CSV, TXT, OFX and QFX among others. The scheduler tab enables you to create a periodical income by entering relevant details like recurrence rate, payee, check, end date, transfer, description and notes.